The second forum is about to get started with the discussion groups at the Baptist Church, Aug 24, 2010. April 2014 – Editor’s Note: In light of the recent OB Town Council meeting that ended up focusing on the homeless, we wanted to repost a report of a Town Meeting on Homelessness – on August 24, 2010! 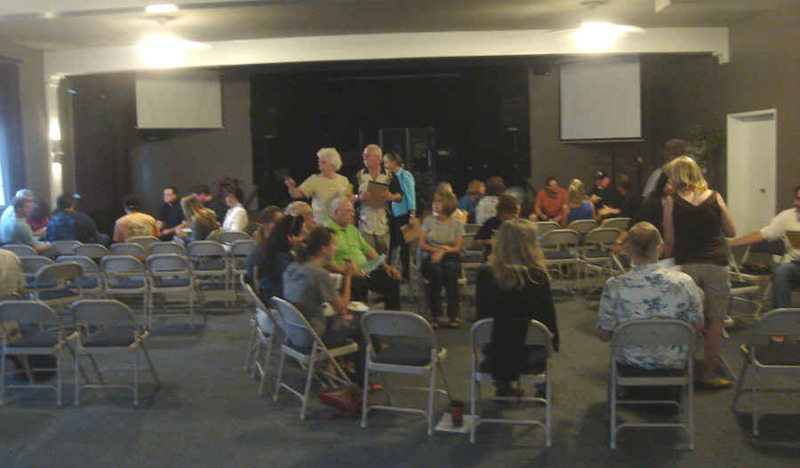 The second in a series of Community Forums on the homeless and homelessness in Ocean Beach was held last night, Tuesday, August 24th. The First Baptist Church on the corner of Sunset Cliffs Blvd and Santa Monica had opened their doors to the neighborhood, offering pastries, juices, coffee, etc. The event was organized by the OB Inter-Faith Community – a grouping of about a half dozen local churches. About sixty people crowded into the assembly hall. After some brief intros by Jack Hamlin, we were directed to choose one of four areas to meet over – public facilities, community, government, and activities. Jack is a Catholic lay organizer and “jack of all trades” he told me. I chose “community” and sat down in a circle with about a dozen other folks. We had three young college women from Point Loma Nazarene, Pastor Karen from the Lutheran Church, the former head of the Coalition for Affordable Housing, the owner of the Green Store, Steven who served as our facilitator, the head of the County Task Force on Homeless, Jim – a guy who lives out of his van in OB, and the rest of us community people. For about an hour and half we discussed what we’d like to see happen, how we can do it and what we would do towards that goal. I don’t know what the other groups came up with – as another report will be made by the organizers on what everyone covered. But our group came up with a number of suggestions. Chief on our plate was some kind of permanent homeless coalition for Ocean Beach. It could be a larger coalition than that already organized by the churches. We’d like to also see some kind of liaison person who knows all the homeless services available who would be able to direct homeless folks towards those services. We also discussed having some kind of day drop-in center, that would be a safe place, where houseless people can do their laundry, have access to info of different programs, etc. Some of us felt that such a center is important but would run into a terrible anti-homeless bias out there. It was mentioned that a center has been discussed for years in this community. I reminded people about the old Inbetween, a drop-in center on Newport Ave for young people and street people in general back in the seventies. I had worked there for a year. When government funding dried up, it had to close. (Now it appears that two story building will someday be a high end Italian restaurant. People in our “peace circle” also were interested in a voucher program for homeless that other cities have – people give homeless a voucher instead of money that can be turned in at local markets. They can get food and drink but not alcohol and cigarettes with the vouchers. We were informed of a number of groups and programs out there for the homeless. We would like to research a number of them. Everyone was friendly and hopeful. But there was a certain seriousness to our discussions. We want to see something actually happen that involves the homeless in our community. We want to see some real results from these series of forums and discussions. Jack Hamlin closed the meeting, thanking everyone and promising a report out soon on what the different groups came up with. He also promised another forum “within six weeks,” he said. Great to be at the event, and to see the community members who care so deeply. There are couple of efforts upcoming that have a direct impact on working to alleviate homelessness. The 100K Initiative is focused on downtown San Diego, but the same concept could be applied to O.B. The RTFH Point-In-Time count will be held in January 2011. We would greatly appreciate your involvement in helping us to assess an accurate count of homelessness in O.B. – the results of the count lead to many things: awareness, understanding, regional funding, and more. To be able to accurately explain the crisis to our elected leaders is the power needed to induce action on their part. I hope you can join our efforts, and thank you for all that you are doing, your compassion, and your commitment to your community and fellow citizens. Just one correction for now, more later…. There’s a great book to read which came out this past month (I’ve read it and highly recommend it!!) written by a resident in Pt Loma: h.Alton Jones. The title is: The Man on the Bench. It’s a true story about a homeless man who sat on a bench on Rosecrans St one block north of the Post Office on Canon St for around 10 years and the search for his family after his death this past year. It tells about the interactions between the author and the Man on the Bench over a number of years! It’s a paperback and sells for $14.95—maybe less on Amazon.com (I don’t know). I “knew” the man on the bench when I lived on that side of the hump. It sort of cracks me up how some folks on that side of the Peninsula now consider themselves to be heroic for taking care of “the man on the bench” and folks here in OB are considered to be excessively tolerant when we stand up for the rights of the homeless. Thanks for the tip Donna.